You never thought you’d hear the day when doctors would tell you to hold back on the fruit — but they are when it comes to the "fruit" that comes in a glass. A recent study shows that the fruit juices we’re drinking could be doing more harm than good because of all the sugar they contain. But what does that mean? As you probably know, store-bought fruit juice is not allowed on Phase 2 of the HCG Diet unless you own a juicer and make it yourself within the other fruit guidelines. If you’re on HCG Maintenance Phase 3 or are in the On With Life Phase; be careful when turning to fruit juice as a healthy beverage because it’s not that much better than soda. 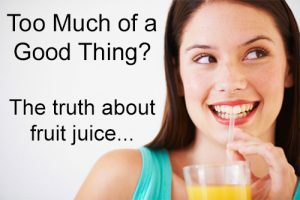 Many juice varieties have a lot of sugar in them while the fiber (pulp) has been removed. A glass of orange juice, whether fresh-squeezed or not, has about 1 teaspoon of sugar per ounce while a glass of soda has about 1.25 teaspoons of sugar per ounce — not that much more. The healthiest thing to do would be to eat a fresh orange but if you’ve got to have your juice in the morning; squeeze it yourself since even “100% Pure, Not From Concentrate” is made using a chemical process and is nothing like what you could make in your kitchen. Even better, so you’re not throwing away the meat of the fruit and missing out on fiber and nutrients; throw a quartered, peeled orange in the blender with ¾ cups of ice and a little all-natural stevia and blend until smooth for a truly healthy smoothie! For more drink options for Phase 2, Phase 3 and for life; try one of our recipes found in our 101 Worry-Free-HCG Diet Recipes cookbook. Using flavored stevia; some of these recipes include "Strawberry Lemonade", "Lemonade", Iced Raspberry Coffee" and "Hot Chocolate". Or, if you are craving soda; try the mock "Root Beer", "Mock Dr. Pepper" or "Mock 7-UP" recipes.